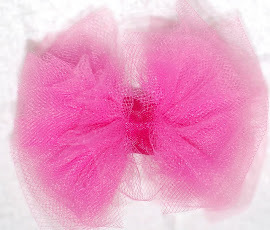 I have noticed that there is a lot of tulle being used in children's clothing stores. Gymboree just came out with a tutu line that is darling. I splurged and purchased my little gal a darling tutu. I have to result to bribery to get my little gal to take it off so I can wash it. 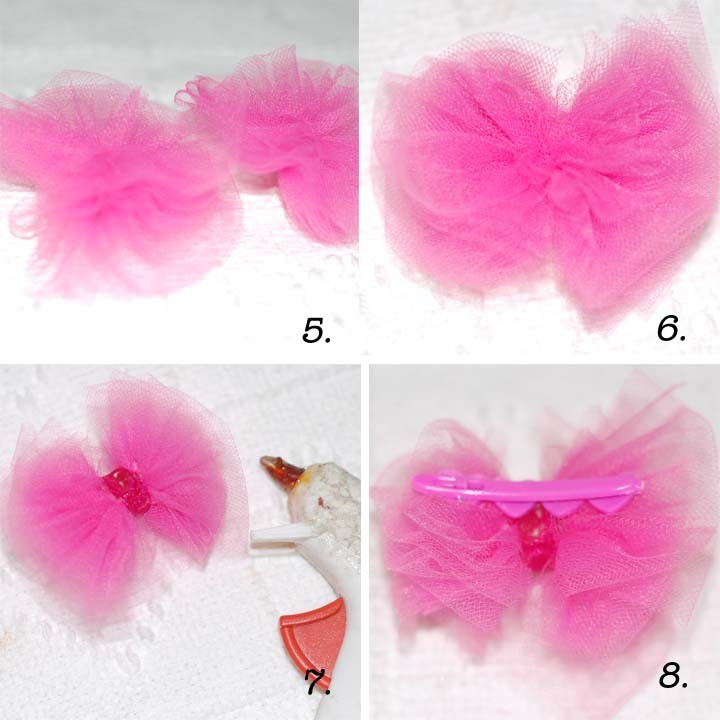 Of course every girl needs a hair bow to match so I have created a tutorial for the bows I made. Here it is. 1. Take 1 strip of tulle and fold it into an accordion, 6 folds on both sides. Mine have a space of 2.5 inches between the folds. * You want the length between the folds to be smaller than the width of your material. 2. Crunch the center together. Raw edge to raw edge. 3. Tie your center crunch together. I used a small piece of left over tulle but any thread or ribbon will do. 4. Pull apart each layer to give it some volume. 5. Repeat steps 1-4 with your second piece of tulle giving you two bows. 6. Place your two bows on top of each other and tie them together. 7. 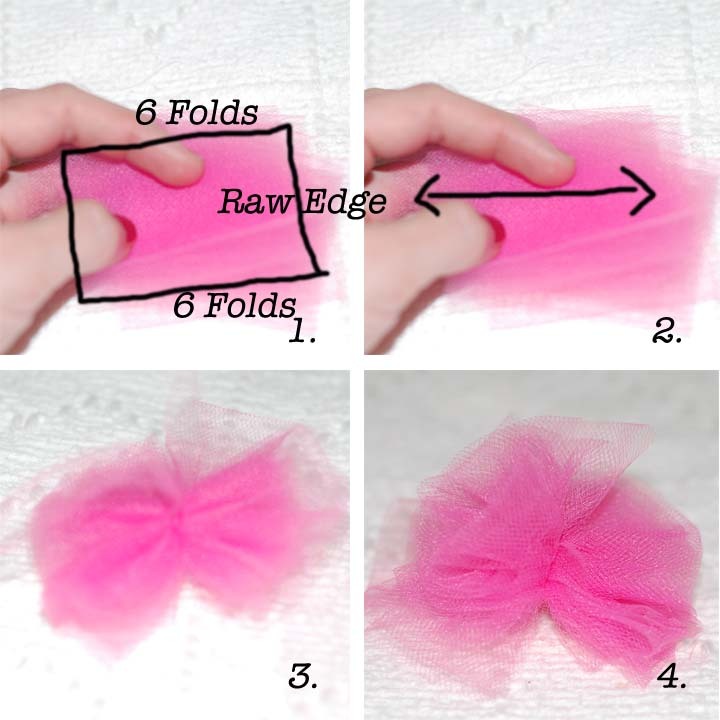 Hot glue your ribbon down the center of your bow. You can make more to match, make them bigger or use a few different colors in the same bow. The possibilities are endless. great! thank you for sharing with us! Oh how I love tulle! These are so sweet! you just can't go wrong when little girls and tulle are involved! oh so cute,, got to make some for the grandbaby girl coming soon. Thanks for sharing how you did it. 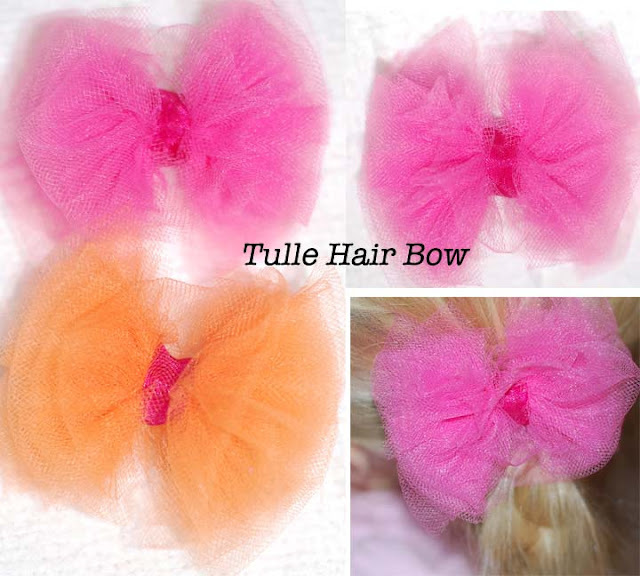 so cute...do you have a tutorial on how to make a tulle puff hairbow?? I m fond of your blog and keep visiting it. I love writing on my blog and showcase lovely items. I added one of your item in my blog post and linked back to you from the image.